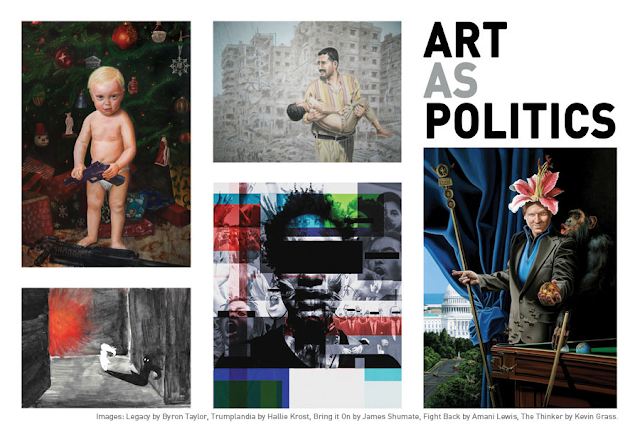 Touchstone Gallery’s timely exhibition, Art as Politics, puts together something that is such a Washingtonian art genre: political art! Artists from across the nation who want their visual arts opinion to be heard along with the current two rather unlikable characters running in the 2016 election cycle. McLellan selected 127 works from the several hundred submitted. It’s an all media show including wall pieces, video installations and sculpture. Artwork for the exhibition will be traveling to D.C. from California, Texas, Arkansas, Illinois, Missouri, Michigan, Maine, Ohio, Iowa and many other states. Touchstone’s August exhibits include both Art as Politics in the main gallery and Touchstone Member’s Summer Sampler Summer Sampler works in the Annex gallery. At the Opening Reception on August 5, 6 - 8:30pm prizes will be awarded to three of the participating artists. MARY ELLEN (M'EL) ABRECHT, MICHAEL AUGER, BE/CAUSE - COLLABORATION BETWEEN ROSSANA JERAN AND MARTIN DIGGS,GINNY BAUGHMAN, RON BECKHAM, MARY BISHOP, STEPHEN BORKO, JILL BRANTLEY, KELLY BURKE, TAYLOR CALLERY, AUGUSTINE CHAVEZ, CHRISTOPHER CHINN, KATHRYN CIRINCIONE, JOHN H. CLARKE, MISTY M. COLE, K. M. COPHAM, JIM DESSICINO, EILEEN DOUGHTY, JULIA DZIKIEWICZ, JOHN FIGURA, MICHAEL FISCHERKELLER, CONSTANCE FLERES, FUENTES, RIC GARCIA, KEVIN GRASS, TRISHA GUPTA, AMANDA MARIE HARNER, KRISTEN VICTORIA HARNER, E. SHERMAN HAYMAN, DAN HILDT, ERIN HOFFMAN, MICHAEL PATRICK HOLT, LORRI HONEYCUTT, MARCUS HOWELL, ROBERT S. HUNTER, ED HUTCHINS, JINNY ISSEROW, JUDY JASHINSKY, R. JAY JAY JOHNSON, TIMOTHY JOHNSON, ERIC JOHNSTON, GLEN KESSLER, SALOMON KHAMMI, HALLIE KROST, MICHAEL LANG, JEFF LASSAHN, AMANI LEWIS, ASHLEY LLANES, GEORGE LORIO, SHELLEY LOWENSTEIN, PATRICK A. LUBER, ROSEMARY LUCKETT, BONNIE MACALLISTER, CATHERINE C. MARTIN, PENNY MATEER, PETE MCCUTCHEN, IAN MCDERMOTT, MARLA MCLEAN, REBECCA MCNEELY, MIKE MCSORLEY, CHARLES MENDEZ, RAM - RASHAD ALI MUHAMMAD, DAVID NELSON, KASEY OBOYLE, MARY OTT, SANDI PARKER, GAIL PEAN, JAMES PENFIELD, JOHN PUNSALAN, MICHAEL RICHISON, FEDERICO A. RUIZ, CINDY SACKS, MEG SCHAAP, STEPHEN SCHIFF, JENNIFER L. SCHMIDT, DAVE SEILER, TOM SEMMES, ALI ONUR SENGUL, JANATHEL SHAW, ANNE H. SHIELDS, JAMES SHUMATE, JANOS SOMOGYI, MAUREEN SQUIRES, ANN STODDARD, BYRON TAYLOR, DORRI THYDEN, PATRICIA TURNER, SHAUN VAN STEYN, ANDRE VELOUX, RUBÉN ALEJANDRO LEBRÓN VILLEGAS, NAOMI VOGELS, CATHY WILKIN, CLARE WINSLOW, JENNY WU.